A Chicagoland staple newspaper, the Daily Herald, posted on Facebook yesterday, encouraging people to share their stories. I shared a brief tidbit of mine, and they asked me if they could quote me. Of course they could. Toys R Us. Our “local” Toys R Us was beyond Woodfield Mall in Schaumburg, on Golf Road. That was before they had a stoplight at the corner on the crossroad to get into the place. When we were kids — and I don’t even remember what age I started going there — it was a major treat for us. As I said for the Daily Herald, when we were kids, the places that were treats for us to go to were: Toys R Us; White Castle; McDonalds with a Playland; Holidomes; Kiddie Kingdom. Not exclusively, but those were pretty cool go-to places. Between my parents and my Grandma and Grandpa (my Mom’s parents), we were spoiled a bit even by just going to Toys R Us. The Toys R Us in Schaumburg, I believe, was one of the older, smaller stores, but even as an adult, I’d drag Noel (and Mom too, I think) out there to get some gift or another for the nephews and niece. 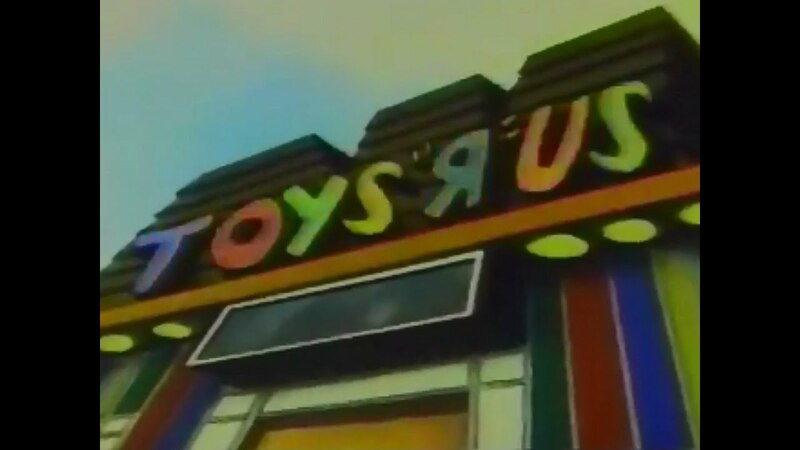 It was kinda “our” Toys R Us, even after I discovered there was one in Niles (other direction but still on Golf Road, I think) and one opened up on Rand in Arlington Heights when I was in university. Back to being a kid: I don’t really always recall what we got but I do remember visiting Toys R Us as a kid and loving visiting the seemingly ever expanding video game aisle, but that was when I was maybe 10 and above, when Nintendo and Sega first started getting their footholds in the States. Our most favorite aisle (and maybe aisles) were the ones with He-Man and GI Joe and Transformers. Just looking over all the cool figures and playsets and vehicles you could get was enough to sate your appetite. Brian and I (at least. Maybe Jeremy sometimes, although I think he was a bit too young at the time) would look through the figures on their cardboard backs, hanging on the metal rod poking out from a most likely particle board shelf fixture, to see if there was a rare or coveted figure we wanted. I am pretty sure I remember getting King Randor and the Sorceress from the He-Man range when I was older. I loved Transformers too, but my memory leads me to believe He-Man figures were about $5 each whereas Transformers — the decent figures in boxes — tended to run a bit more expensive. Those memories, though, were when I was older. I might have been at the end of elementary school or starting junior high at that age. When Brian and I were younger — and before Jeremy was born and when he was a baby and toddler — our Grandma and Grandpa used to let us stay over at their apartment for a week in the summer. I don’t remember if it started as both Brian and me together and then we each had our own week or if it always had been our own week each, but that probably doesn’t matter. What mattered was that one of the highlights of that week with Grandma and Grandpa was the trip to Toys R Us and being able to pick a really good toy. I admit, I was jealous of Brian one year. That year, the lucky sod got Optimus Prime. I don’t honestly remember which toys I ever got. For a while, I must admit, I soured on the idea of Toys R Us. There was a Child World, the second largest toy store in America, in Mount Prospect, my hometown. They’d put it in three quarters of the old ice skating rink on the southeast corner of the Randhurst (Mall) lot, the back facing on to Kensington Road. The remainder of the building would always have rotating tenants throughout the time Child World was there, or be completely empty other times. One of Brian’s baseball teammate’s mothers worked at Child World. When I was approaching the age where I needed to get a job, I was still big into toys, and working at a toy store was a total dream come true. So when Kathy — and I apologise as I have forgotten her last name, and I would have normally called her Mrs. Whateverherlastnameis — offered me a job, I lept at the opportunity. Over summers, I worked full time at Child World, but during the school year, I limited myself to Sundays only. Probably to the consternation of the managers, that Sunday-only thing, but high school and my education honestly were more important. Only being there for a short time, and working as a cashier initially, I was roped into FES — Front End Service — doing things like returns, damaged stock, and the like as well. I helped get one of my best friends ever John a job at Child World as well, and that was great fun too. Working in your dream job and working with a great friend? Score! Child World taught me a lot of foundation skills. Ten keying — using the 0 to 9 keys on the side of your keyboard — was the way we entered in SKU numbers on products. No scanners in those days, at least when I started at Child World, and so we had to enter every item by hand. If the product wasn’t in the computer, we’d have to microfiche the item, and if we were super lucky, we’d find it on the list. Since I was so damned trustworthy — and I still am — the bosses would trust me and someone else to go deposit money in the bank. There was one in the mall itself, but the drive through immediately outside that part of the bank closed soon after I started at Child World, and the bank relocated to the opposite corner of the Randhurst complex, so it was in the northwest corner, bordering Euclid and Elmhurst. Most times, Irene (who also would dress up as the mascot Peter Panda on special occasions) and I would go do the money run, but sometimes I’d go with a boss or another colleague. It was nice to get out of the place. A few times, a manager we had for a while that I worked there and I would go in his car, a Porsche 911. It was the first time I’d ever been in a Porsche, but I think Porsches of that era are stunningly beautifully designed, and it was my first time in a luxury car. One day, I was having a conversation with a classmate in gym class about pay. I had started at Child World at $5 an hour and I was up to about $5.75 an hour at that point, when minimum wage was about $4.25 an hour. All I kept hearing about was how lucky I was, and yes, I was. I think I maxed out there at $6.50 an hour, which was pretty good pay for a 17 year old. I also learned how to go gather shopping carts and steer them into the building. It was difficult getting all those carts perpendicular to the entrance then scoot them around 90 degrees to get them through the air curtain / breaker area and into the cart lobby at the entrance. Interestingly enough, I keep ending up showing people at my local supermarket how to use this skill, so I guess it is still helpful to this day. My fear of height abated at Child World. We had these massive curved front windows — it was like a large arched window at the front of the building — and during slow summer days, I was sent up the scafolding thingy with wheels to clean the windows. I didn’t mind as I found it a good way to unwind, and even though I was afraid of being that high up, I grew used to it. It helped me later when I would end up helping stocking shelves with John and Kyle (who I’d known since Sunday School) and a few other guys, because the stock sometimes was above the shelves, so we’d have to get the boxes down to price the toys and put them on the pegs or shelves on the shelving units. As a cashier, if I was working until the end of the day, I had to reconsile my cash drawer. I was only out a few times — everyone gave me a hard time for always getting my drawer pretty spot-on even — but when I was, it was always under a dollar off. Not bad. Working in the little hut that held all the video games was so much fun but kinda creepy at the same time. In those days, you’d pick a ticket out of a pocket from a group of pockets, each one for a different video game. The theory was that there would be the same amount of tickets on display as video games out the back. It didn’t quite go to plan all the time. When I first started at Child World, one of the cashiers would man the hut all the time during the busy part of the day, but as time went on and times got tougher, it was manned as-needed. Because I was FES, I had keys usually, so I’d go in and get the games. The more popular games were nearer the entrance of the hut, but the more obscure ones were out the back, which was kinda creepy as you had to go around a wall that jutted out into an area crammed with a million different games and bad lighting. It still was cool to see all the games that were available though. There were a few “hot” toys around. I remember getting the requests for April O’Neil, from the Teenage Mutant Ninja Turtles range, and also Splinter, their leader, as those were very rare. Some days, when it was a bit slower, I’d go out back into the huge warehouse behind the store — the ice skating rink lines were still painted on the pavement below — and dig through boxes to see if I could find these rare figures for customers. Sometimes Dave, the semi-deaf stock guy who was pretty cool, would help me out. It was nice to help people. My senior year in high school, Child World ran into massive financial difficulties, much like Toys R Us has now. I got the call one day to let me know I’d been let go. I innocently thought it was because I called in sick one time after spending the weekend painting my parents’ addition ceiling with my Grandpa (I honestly was extremely sore and very tired), but looking back now, I know I would have been let go either way because it was something much larger than that. The walk of shame to get my last paycheck was horrible. It was even more conflicting when they called me to help with stocktake or packing up the store towards the end of its life. After a lot of inner turmoil — I was still very hurt but still very new to being employed — I did go in and help. Half the shelves were bare and it was soul-destroying to see the once-vibrant toy store so empty. (I even had nightmares about it for a long time.) We scrounged together money and had a Last Supper together, past and present employees who were gathered there, and it was sombre but heartening as well. We had been a family of sorts, and I never remember any disagreements or office politics. From memory, once the place closed, it sat empty for a while until it started suffering the same fate as its smaller neighbor in the buildling: rotating tenants. Eventually it was torn down and a Home Depot was built there, which stands there still to this day. It was an interesting and good time in my life. It was my first job, but it also was a dream come true to emerge into adulthood working in a toy store, and I would not have exchanged the experience for anything else. After my Child World closed — store number 76, and I think I was employee 31 — Toys R Us opened up a store on Rand Road in Arlington Heights not soon thereafter. Some of my colleages, none of who were in high school any more, migrated to that store, but whenever I visited, it wasn’t the same feeling and vibe as Child World. And, to be honest, I was a bit bitter about it. Losing your first job, much like your first love, is a memorable experience in that bittersweet kind of way. So, to those who have lost their jobs: I’m sorry. And goodbye, Toys R Us, and thanks for the memories.